New manga publisher Denpa kicked off earlier this year to much fanfare. Headed up by Ed Chavez, formerly of Vertical publishing, and Jacob Grady of FAKKU, the new imprint promises several new titles, in addition to taking over a couple titles from FAKKU. 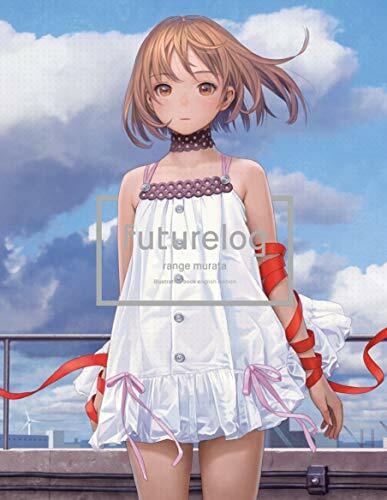 One of Denpa’s new releases is Futurelog, an artbook by Range Murata, known for his character designs in Blue Submarine No. 6 and Last Exile. Futurelog is a collection of comics, posters, sketches, and illustrations, along with a showcase of Murata’s covers and “futuregraph” illustrations for Comic Kairakuten magazine. The book is an excellent exploration of Murata’s artistic range, showcasing cute girls, rugged men, planes, trains, automobiles, and landscapes, and includes both original art and illustrations based on existing properties. All of the manga sections and text are fully translated into English, making both the short stories and the notes accompanying sketches easy to follow. Futurelog is a substantial release, measuring nearly a foot tall and containing nearly 300 pages. The pages themselves are a collection of different paper stock. The separators between sections are stiffer than the pages containing illustrations, which themselves differ from the pages containing sketches. In addition, the book also contains many fold-out posters, arranged in an incredibly manageable way. They’re not in the way, but they’re also very easy to index when looking for them. As if to wrap the whole package up, the book’s presentation is equally impressive, consisting of a plastic outer cover enveloping the dust jacket around the book proper. Futurelog comes highly recommended to fans of Range Murata, of course, but appreciators of art in general will also get a lot out of it. A general word of caution, however: The book contains illustrations that might be considered “lolicon” to some. If you have hang-ups about that, best to skip it for your own sake. Futurelog is available on Amazon and Rightstuf.